For many of us, sitting in front of a computer is a necessary evil. Not only is that scenario hard on the eyes, it is taxing on the body and the mind as well. So what’s a girl to do? and even more so when the typical workplace involves a computer and desk, as opposed to physical activity. Sitting for hours on end, day after day, weakens core strength and is usually mentally stressful. Core strength is a buzz phrase in the fitness community, but do most people know what that means? Think about a big tree. Its trunk is its core, just as your torso or trunk is your core. For a person, maintaining a strong core involves conditioning your abdominal muscles, the postural muscles in your back and the muscles that wrap your trunk connecting the two. training all of those core muscles. Pilates builds strength, flexibility and body awareness simultaneously through a series of exercises that can be tailored to meet an individual client’s needs. The exercise system designed by Joseph Pilates in the early 20th century offers resistance training without using heavy weights. The German-born Joseph Pilates developed Pilates in the 1920s during his World War I internment in England. To encourage fitness in his fellow internees, Pilates fashioned resistance-training equipment from bedsprings and parts. After the war, Pilates immigrated to the United States and continued to develop the method in the same building as the New York City Ballet. by athletes who needed strength, toning and efficient movement. 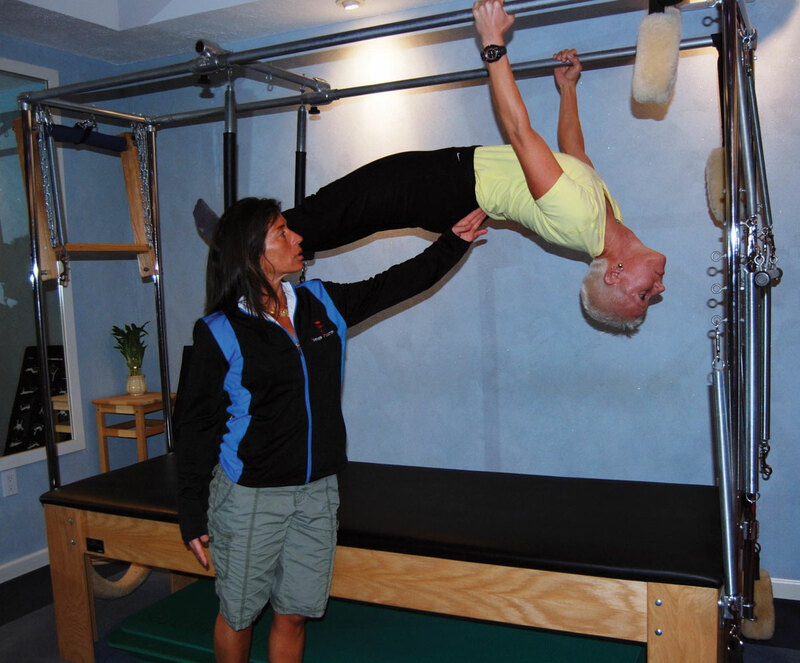 Under the watchful eye of a trained professional Pilate’s instructor, a client performs a series of exercises that artfully require movement against the resistance of springs. Instructors must be trained and certi fied to properly adjust springs and pulleys to individualize resistance training. This aspect of Pilates is especially useful when a client may need rehabilitation from injury or surgery, such as hip or knee replacement surgery. However, it is also important to people who want toning, fitness and ease of functional movement. In addition to the therapeutic benefits of Pilates, the exercise system also offers another selling point. Pilates can enhance sports performance, whether it is golf for seniors or scholastic sports, including lacrosse, soccer or basketball. While many gyms offer Pilates classes, clients should not assume that a group mat class offers the same benefits as one-on-one apparatus training. Each client has individual weaknesses, and using the apparatus offers support plus an opportunity to improve strength and condition. the resistance and sequence of exercises to meet a specific client’s needs. Depending on the client’s health status, those needs may fluctuate from week to week, or even day to day. Pilates can be simultaneously therapeutical and recreational while countering the negative aspects of the workplace. Pilates, when practiced on a regular basis, assists the client in developing strong muscles that are long and lean, sculpting the body while strengthening. of the system is the body-mind connection. Clients must keep their minds on each exercise they perform; there is no place for distraction. Since Pilates is based upon core strength, the client must keep their mind in the movement. Nancy Hawkins Rigg is the founder and owner of Forever Fit Foundation, a personal training business specializing in Pilates, Gyrotonic, Gyrokinesis, Yamuna Body Rolling and sport specific training. 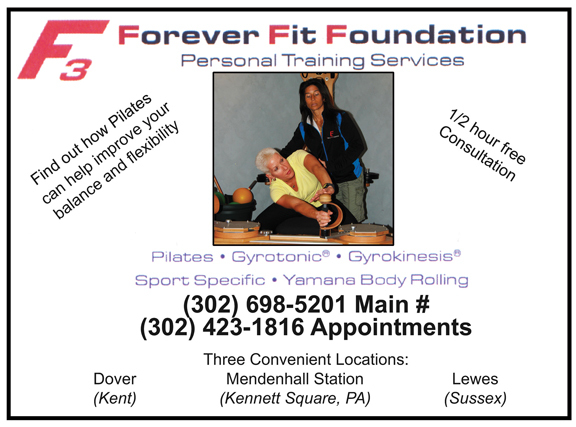 Forever Fit Foundation accepts clients at three sites: Dover and Lewes, DE., and Mendenhall Station, Pa., just over the Delaware line. A certified athletic trainer, she earned her bachelors degree from the University of Delaware and her master’s degree in exercise science and sports medicine from Miami University in Ohio. Please call (302) 423-1816 or (302) 698-5201 to schedule an appointment for more information.